Home \ Cooking \ Rainbow Rosette Cake! Hello again! 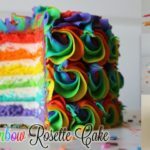 I hope you enjoyed today’s Rainbow Rosette Cake tutorial. This cake was so much fun to make, with easy techniques that produce a stunning cake! I saw the original icing tutorial on Kawaii Sweet World’s channel, and she mentioned she saw the technique on @doughmestichousewife IG page. Be sure to check them both out!